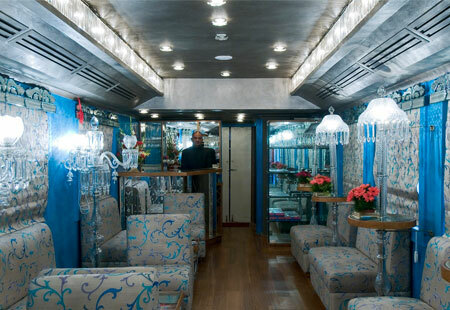 The palace on wheels is without a doubt a pure pastiche of royalty, luxury, adventure and beauty as far as trains are concerned. It was refurbished and re-launched in the month of August 2009 and that is when it won the PATA Gold Award and along with it, the train was votedto be the world’s fourth-best luxury train. This train is more than famous with people all across the globe. The guests onboard this train are treated to an extraordinary time all the while. Besides the care nonpareil, the guests are treated royally and that’s what takes the cake! 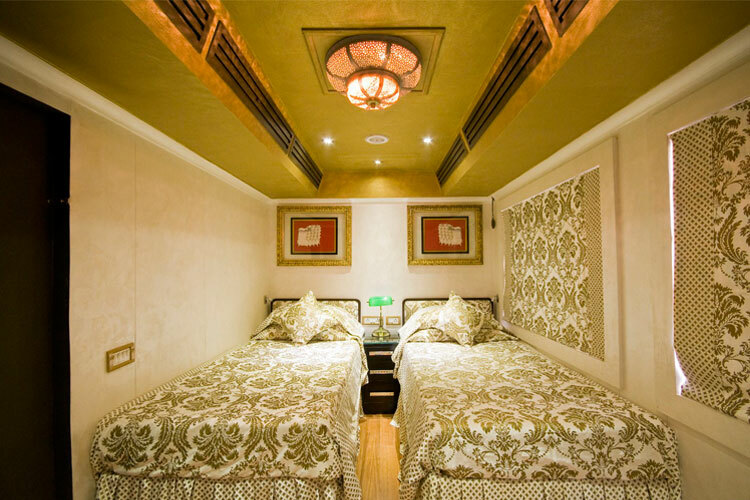 This royal Palace on Wheels takes its guests on a magnificent odyssey to the spell-binding destinations in Rajasthan. The train is always hailed for its regally ostentatious interiors that reflect the glorious eras of the Maharajas of Rajasthan! 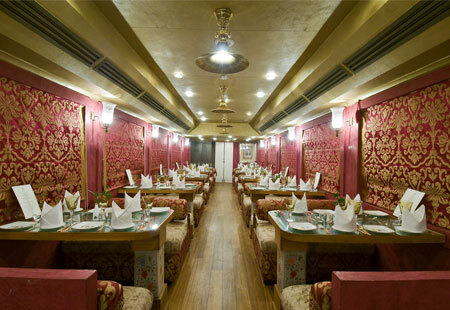 The Palace on Wheels sets on its 8 days and 7 nights sojourn from Delhi, where the guests have been welcomed aboard at the Safdarjung Station and from there the train departs for Jaipur, every guest is treated to a sumptuous dinner. On the second day, the train reaches Jaipur, the guests are served delicious breakfast and when alighting from the train, they are welcomed yet again with the cheering Shehnai hoots and clamours and garlands. From there everyone boards a coach that takes them sightseeing! The visit to the Albert Hall Museum, the Hawa Mahal, The JantarMantar, the City palaceinterspersed with a little bit of shopping and the magnanimous elephant ride followed by a lip-smacking lunch at the Amber fort! At around 6 P.M. the guests return to the train and are served dinner at night. On the third day, even before the crack of dawn, the guests arrive at SawaiMadhopur and at around 6 in the morning, they are scheduled to leave for the Ranthambore National Park, the breakfast is arranged for the travellers in the course of the journey to Ranthambore. After Ranthambore, they reach Chittorgarh at around 4 in the morning and almost immediately depart for sightseeing, the evening tea and snacks are arranged for the guests and a light and sound programme at the fort to go with it. The next day, after the departure from Chittorgarh at 2 in the morning, the train reaches Udaipur at around 8 A.M., after the breakfast, the guests depart on a coach for sightseeing. A wonderful visit to the Saheliyon Ki Bari, the City Palace and Crystal gallery are just about to seep into the senses when a grand lunch at the Palace hotel just makes everyone forget everything else and dive right into the delicacies! Thereafter letting the food settle inside the gut a little and be an aid to the digestion, the guests indulge in some boating on the tranquil waters of the Pichola lake. After about half an hour, the guests arrive at the station to board the luxurious train once again, to take them to one of the most bewitching places in Rajasthan, Jaisalmer. As the guests reek of Rajasthan and it’s royalty and discuss their expectations for the next day, the dinner is served. On the fifth day, the train reaches Jaisalmer at around 8:30 in the morning, just about an hour from their breakfast. On their arrival, they embark on a journey that will stay with them for the time to come, they visit the Gadisar lake, the ‘Sonnar-Kella’ aka the Jaisalmer fort, they tour the city and its numerous Havelis. After a heavenly lunch at the palace hotel, they depart for the Sam sand dunes for some other-worldly camel-riding and some piping hot tea. At around 7:45 in the evening, the guests return to the train for dinner and another cultural program after which at the stroke of midnight, the train leaves for Jodhpur. After visiting the Mehrangarh Fort, Jaswant Thada, Umaid Bhawan and indulging in some occasional shopping, the guests are treated to a magnificent lunch at a 5-star hotel. Once Jodhpur is left doing all the talking in the tummy, the guests return to the train and depart for Bharatpur at around 3 P.M. On the seventh day the train reaches Bharatpur and the guests after doing their regular morning chores on the train, depart for beholding the Keola Deo National Park. On their return to the train, they have their breakfast while the train chugs towards Agra. At around 10 A.M., it reaches Agra, after a little rest, the guests depart for a visit to the Agra Fort. At around 1:30 P.M. they have their lunch at 5-star Agra hotel. Post that, they visit the gloriously sublime Taj Mahal. The guests are filled with awe by this time and they just can’t get enough of Taj, when they go on a little shopping spree and hop back onto the train for their final destination, Delhi. The train reaches Safdarjung station, Delhi on the eighth day, after the last scrumptious breakfast, they deboard the train with memories that will last them for time immemorial.